A supposedly average boy realizes that he’s not so mediocre after all in this debut middle-grade novel. James thinks he’s a typical 11-year-old, which suits him just fine. His father is gone, his mother hates him (she commonly wishes he was never born while on the phone with her friends), and he has no siblings. James, who earns C’s in school, looks rather ordinary (he certainly isn’t handsome). Instead of fighting it, he embraces his mediocrity, declaring himself the best average guy the planet has ever seen. One day in a garden, he meets Mayor Culpa, a talking goat. Following the animal, James finds himself suddenly transported to another world. The chatty creature reveals that he’s a Scapegoat (“As long as I’m to blame, no one else can be burdened. It’s what I was bred for”). He tells James that he can become the Kingdom of Average’s new ruler. But to claim the crown, the boy must first complete a mission—find the old king and discover why he abdicated the throne. Mayor Culpa, professional optimist Monsieur William Roget, and Roget’s pint-sized pessimist, Kiljoy, join James on his journey. They travel from Disappointment Bay to Serenity Spa to the Unattainable Mountains, and as their quest evolves, James begins to learn that maybe he’s not quite so mundane. When they reach the part of the kingdom dubbed Epiphany, James finally grasps who he is—someone extraordinary. While James initially believes that he’s mediocre, Schwartz’s novel assuredly is not. This is a volume that kids and parents can read together because it works on two levels—young ones should love the adventure-packed plot and hilarious characters, and grown-ups should chuckle at the wordplay embedded in every page. Schwartz’s characters are more than clever—they’re ingenious. Mayor Culpa constantly apologizes, and Kiljoy represents that little voice inside people’s heads that attempts to invalidate their intentions. These living, breathing allusions effectively push the narrative forward (although Armitage’s sketchlike illustrations fail to enhance the story—such fanciful places and characters should be left to the imagination). Schwartz’s nicely succinct writing style places the focus on the striking worlds he creates. The book delivers an important lesson—be your own hero. With this debut, the author should soon be a hero to readers everywhere. 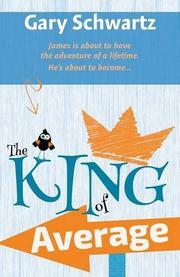 A skilled and witty tale about a boy who would be king that should appeal to children and adults.